Here’s the top of my BusinessWeek story about Facebook’s big new financing round based on brief yet exclusive interviews with Facebook CEO Mark Zuckerberg and investor-of-the-moment, Russia’s Yuri Milner. Ending months of fevered speculation over whether it would raise more money, social network Facebook said on May 26 that it will take a $200 million investment from Russia’s Digital Sky Technologies. In return, DST is getting preferred stock worth 1.96% of Facebook, valuing the social network at $10 billion. This is the first time Facebook has raised major equity funding since late 2007, when Microsoft (MSFT) invested $240 million in exchange for a 1.6% stake that valued the site at $15 billion. In a move that will help Facebook employees unlock some of the value of their shares before the company goes public or is sold, DST will purchase at least $100 million of Facebook common stock from current or former Facebook employees. DST co-founder Yuri Milner tells BusinessWeek that the agreement to buy common stock was not a precondition of the equity investment. “These are two separate transactions,” Milner says in an interview. DST and Facebook say they will release details of the plan this summer. What in the World is Going On with Facebook? Check out my story on Facebook, called “Facebook’s Land Grab in the Face of a Downturn.” It’s about the startup’s audacious gamble to chase user growth in the middle of the worst economic crisis since the Great Depression. – To grow its user base, the company has lowered its revenue goals. In January, founder and CEO Mark Zuckerberg said Facebook was shooting for revenues of $300 million to $350 million this year. But this spring, Zuckerberg and his board lowered the revenue target to $250 million to $300 million, say sources familiar with company finances. – Despite intense speculation, the company is not running out of money. It has raised about $500 million and is “slightly cash-flow negative,” says Facebook director and investor Peter Thiel. At its current burn rate, he says, the company has enough cash for three or four years. – The company is gearing up to do acquisitions, particularly of overseas foreign networks. – The company is seriously considering a plan to take a cut of money from the software developers who create applications for the site. Vice-President Chamath Palihapitiya, disclosing the initiative for the first time, says the company may be able to help these startups generate more cash from advertising or e-commerce and then take a slice of that revenue. Today, Facebook announced Matt Cohler was leaving the company to become a general partner at Benchmark Capital. A long-time Facebook exec who was part of Mark Zuckerberg’s brain trust, Cohler was vice president of product management, and his presence will be sorely missed. Kara Swisher reports that Cohler was not pushed out, and I have to believe that is true. That Cohler will remain a “special advisor” to Zuckerberg and the company’s management after he leaves is pretty good proof that this is an amicable separation. Cohler, a really smart, cool and nice guy, was very popular at Facebook, and always seemed to know his role as Mark’s consigliere and didn’t step over those bounds (unlike some other execs). When I asked him a few months ago what advice he gives Zuck, Cohler wisely replied: “I ask him questions and that elicits things.” A guy with a golden touch, Cohler will be a great asset at Benchmark, helping them suss out Internet investments. Cohler joined Facebook in the summer of 2005 at Peter Thiel’s request. Here’s an excerpt from an interview I did with Matt from June 2007 when he spoke about how he joined Facebook. It shows you the tightness of the Silicon Valley network. He was an exec at LinkedIn at the time but felt that Facebook was a “once-in-a-lifetime opportunity” that could not be passed up. One key question now is this: Who will take over product management when Matt leaves in the fall? Product management is still arguably the most important job at Facebook. It will be interesting to see if Mark Zuckerberg takes it over, or if he appoints someone else from inside the company. It’s hard to see Facebook bringing in an outsider to take over product development at this point, given its importance and the uniqueness of the company’s culture. I’ve been down at the South by SouthWest Interactive Festival since Sunday. Hence the lack of posts since then. This conference is totally overwhelming–in the best of ways. 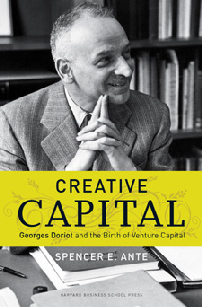 About two hours ago, I gave my debut reading of Creative Capital at the conference. And now I am off to moderate a panel on municipal WiFi before heading home to New York tonight. At that point, I expect to start posting on a more regular basis. In the meantime, here’s a link to a story I co-wrote about Facebook CEO Mark Zuckerberg’s keynote address. It’s been the most read story on the BW.com Web site for the last two days. One thing I’ve been thinking about is the hullaballoo over the keynote and its moderator Sarah Lacey, a colleague of mine. Sure, Sarah didn’t host the best interview in the world. But the reaction to the Q&A was totally overblown. It seems like a great example of an online mob mentality. All the twitter posts and blog posts and online stories by mainstream media about the Q&A seemed to over-amplify something that wasn’t that much of a big deal in the grand scheme of things. But you have to wonder how long Zuckerberg will follow the Gates model. He clearly wants to hold on to the reins and he may grow into the role of being a true CEO. But my gut tells me that the company and its investors will bring in a more seasoned exec to take the company public, if and when it goes public. Sandberg, while highly respected and successful, has never been a CEO before and has never taken a company public. And with so much at stake, you’d think the company would want to have someone in the role who’s done it before. That one admission is another sign that Zuckerberg, however brilliant he is as a technologist and visionary, is probably not up to the task of running a multi-billion company with thousands of employees. What did he expect? That management would be any easier than slinging code? The comment just sounds naive. I see Sandberg’s hire as more of a replacement upgrade for Facebook’s previous COO, Owen Van Natta, who recently left the company to pursue opportunities as a chief executive somewhere else. Van Natta was a former Amazon exec, and he did a fine job helping to grow the company and build a great brand. But Sandberg, the vp for Google’s global online sales and operations, is the perfect person to take the company to where it needs to go next–to create a advertising and marketing model that scales into the billions of dollars.